Have you ever become a fan of a movie that is everything you dread in a film? We did when we screened the 1948 comedy Bill and Coo, a movie starring, well, birds. We (as in, yours truly) have nothing against birds. We’re just a little fussy about animal movies, is all. If they’re not animated or packed with Important Information About Nature, we have no use for ’em. Bill and Coo is about birds but it’s not a documentary or animated feature. It’s a live-action film where trained birds act out the story. Yup, actual birds are the stars here – lovebirds, mostly, but parakeets, owls and ducks have supporting roles, too. It’s not much of a narrative, as far as narratives go. The birds live in Chirpendale, a quaint town that has all the amenities. There is a beauty parlour, public transportation and a dodgy-looking “juice” bar. In Chirpendale (and we quote), “love, happiness and contentment blend together in harmony.” We don’t doubt this, judging by the popularity of that juice bar. Even The Starling Bros. circus rolls into Chirpendale with its acrobatic birds and caged animals…one of which, ironically, is a cat. But Chirpendale lives under a dark shadow. The town must contend with the ever-looming threat of the Black Menace, a large black crow, who destroys houses and carries away baby birds. The Black Menace is the worst kind of villain; he waits until everyone is happily enjoying the circus, then he attacks with vigor. EEEK! How will the good citizens of Chirpendale fight him off? See? The film sounds silly, yet we don’t intend to mock it. The narration is amusing, the music is cheerful and the sets (which are the world’s second smallest, according to Wikipedia) are carefully done to scale. You want to see something weird? Do a search for Bill and Coo on any major search engine, and this little movie appears at or near the top of the search results. One can only assume folks are still curious about these crazy birds. The birds were trained by George Burton, a one-time silent film actor. In the short before the film, Burton gives a demonstration with his birds. Using a wand, Burton plucks the lovebirds from their perch and sets them on a mini tightrope. The birds don’t even flinch when Burton transfers them onto a new surface; they stick to it like velcro. Now, you may have objections about birds being forced to wear little hats and pulling each other around in little wooden carts. Perhaps we should be morally outraged, but we’re not. This 60-minute Trucolor film is utterly fascinating. Why? It’s because of those busy little birds. They are Just! So! Cute! Burton’s lovebirds are terrific actors. They run fast and do neat tricks. (One of them turns somersaults, for pete sake!) Clearly, these are smart birds. Sometimes you swear they KNOW they are filming a movie. We hope you’ll make a Note To Self to see the quirky Bill and Coo at your next opportunity. Like the poster says, you haven’t seen anything like it. 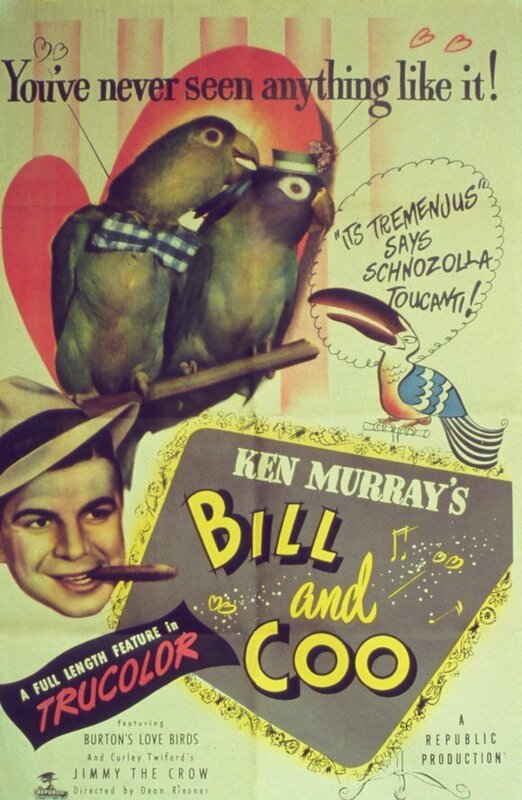 Bill and Coo: starring George Burton, Elizabeth Walters, Ken Murray, and George Burton’s Birds. Directed by Dean Reisner Written by Royal Foster & Dean Reisner. Republic Pictures Corp., Colour, 1948, 60 mins. What? Are you kidding me? I can’t believe someone made this film, and yet I can’t wait to track it down. This sounds fascinating… and a little bit odd. Thanks for the recommendation, and I am sure to check it out soon. This is a crazy, fun movie and I think kids might like it too! I hope you get the chance to see it, Carol. It’s more entertaining than it should be, and you can’t really tear yourself away. Note to self, in Pen! You had me at Just! So! Cute! Thanks for pointing me in the direction of this one! Those birds are adorable. And they seem like they’re having so much fun! I can’t imagine the time put into this flick, either. Those filmmakers would have to have limitless patience…and never mind the clean-up between takes! I hope you have a chance to see it. It really is a crazy flick. Thanks for pulling this one out of the vault. It brought to mind some great memories of Saturdays at the movies. See what a great little movie this is? You remembered it from when you were a kid! I love that they would have this as part of a children’s matinee — it’s a perfect choice. I have a major fear of birds so thanks for the heads up on this on in case I ever come across it. You wrote “We (as in, yours truly) have nothing against birds. We’re just a little fussy about animal movies,” which has me cracking up. Ha! I saw this years ago and had the same reaction: why am I watching this and why can’t I stop? Thanks for the smiles! Isn’t it a crazy film? You just cannot tear yourself away! Ha! At the risk of sounding anti-feline, I love that the kitten is in a cage and the birds are not. We learn something every day. Amazing. On an aside, we took our 13 year old to see the African Queen in the theater last weekend. He loved it as much as any new movie (although he was amused by the ancient special effects). Just goes to show that a good movie is a good movie, regardless of age.